Origin: Pacific Northwest. The Bear, also known as the Elder Kinsman, was a subject of many legends. There are many stories among most tribes about women working in the woods who are abducted by bears. Instead of a beast, they find such a kind and generous soul that they marry him and have bear children. The people admired the bear for his human qualities and great hunting and fishing abilities. When a bear was killed, it was often taken to the house of the chief where it was sprinkled with eagle down - a symbol of respect and greeting - and welcomed as an honored guest. Many families used the bear as their clan crest. 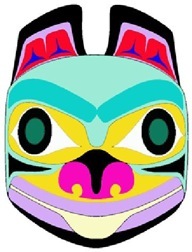 He is probably the figure most often seen on totem poles as well as boxes, bowls and other carved items. His smiling face is on most gift items as a symbol of welcome and friendship. Done in various shades with black and red a constant. 10x20 on 8x8 Plexiglas stand.